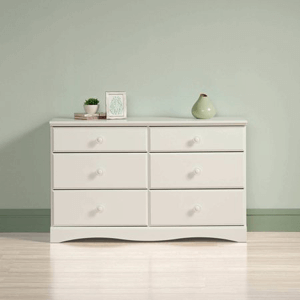 This 6 Drawer Dresser is one functional piece that will not overwhelm your bedroom decor. Everyone needs storage space. These chests are the perfect affordable, stylish solution. Beefy looking solid 2 In. thick legs add style as well as strength. Real bead-board panels provide the latest look in fashionable furniture. The simple design assures that they will blend well in any room in the home especially the bedroom. 3117 Features: Constructed from durable melamine laminated particle board Full height (5 In.) drawer sides Easy glide drawer guides and roomy insides Light and strong Solid leg supports Beadboard side panels Solid metal cup handles Easy to clean Made in the USA Assembly required Available in Walnut, Cherry, Black, White and Oak Finishes. Dimensions: 52+ In. (W) x 15 In. (D) x 31 In. (H) Item Weight: Approximately 95 lbs. Las Vegas Collection Storage Cabinet. 3- Doors and 1- Drawer with 3 shelves Each Section and a base. Comes ready to assemble. Strong MDF Construction. Comes in Wenge Color Only. Please see the rest of the Las Vegas Collection Below.Size: W63 In. H32.4 In. D18.9 In. 6 Drawer Dresser Laminated. Available in Light Cherry, Natural and Black Laminate. Strong Construction. Easy To Assemble. Size: 54-1/4 In. (W) x 28-1/2 In. (H) x 17-5/16 In.(D). Also Available (Not Included In The Price) Mirror: 25 In. (W) x 34 In.(H). Mirror Dresser. This Unique Designed Dresser Features Six Drawers And A Round Mirror. Its Simple And Beautiful Design Makes It The Best Choice For Your Bedroom. It Is Avilable In Two Sizes: 42W. X 18W. X 28H. Or 54W. x 18D. X 28H.. Available In Cherry And Beech Finish. Easy To Assemble. Mirror Chest In Cherry. Features 6 Drawers. Available In Two Sizes: 48 x 18 x 28, And 54 x 18 x 28. Beautiful Design And Strong Construction. Easy To Assemble. Mirror Chest with Light Cherry Finish.Dimensions: 47In. x 19In. x 56In.